Ghanaian players are very good, praises ex-international, Maxwell Konadu, an assistant coach of the senior men’s national football team, the Black Stars. “When we do a good job, it will go a long way to help Ghana as a whole,” he prescribed, during a media interaction on the sidelines of the recent Accra edition of the ongoing Betway Talent Search tryouts. Therefore, he stressed the imperative for the state to pay attention to grassroots football in the country. Maxwell Konadu has been part of the scouting team that has toured all 10 regions in the country to select players for the finals of the Betway-sponsored project. He identified the lack of proper infrastructure as a hindrance to the efforts of young players in reaching their goals. “I am not surprised about the quality of talents discovered so far in the talent search. We have many raw talents in the country. Our pride is seeing these products going higher. “The problem we have in the country is infrastructure. With the right infrastructure, we can groom top quality players. “A lot of the players do not get to the peak because of the lack of infrastructure,” he said. The Talent Search – in its second year – is a novelty project that seeks to discover football talents from every part of the country. This year’s edition, screened by technical eyes led by ex-Black Stars capt., Stephen Appiah, has toured all 10 regions in the countries, climaxing it with the Greater Accra tryout, held at the University of Ghana Stadium, last Saturday. 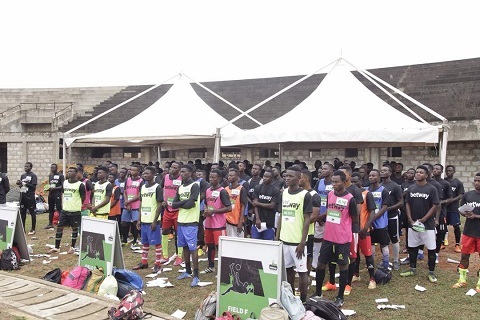 Over 370 players showed up and were taken through drills and selection processes by the scouting panel of Stephen Appiah, coaches Michael Osei, Eric Antwi of Lizzy Sports Complex, Godfred Adoube, Sam Johnson, Mohammed Gargo and Maxwell Konadu. Forty players were selected and will be joined by their colleagues from other regions today Monday, September 3, 2018 at the Lizzy’s Sports Complex to fight for available spots in the Southern team.